Often homeowners and customers are reluctant to purchase a glass system because they believe that they'll be spending all of their time cleaning the glass rather than enjoying it. In reality, glass railings rarely require any more maintenance than other railing systems. Simple spray the glass lightly with a hose and wipe away to remove any stubborn dirt or debris. Using a simple glass cleaner such as Windex can also help remove the dust and deliver a streak-free shine. Another great trick to help keep your glass panels or balusters looking their best day after day is to lightly coat the glass panels with RainX directly after installation and then seasonally. This will help the rain bead up and roll down the glass quickly, allowing nothing to grab hold of your railing. 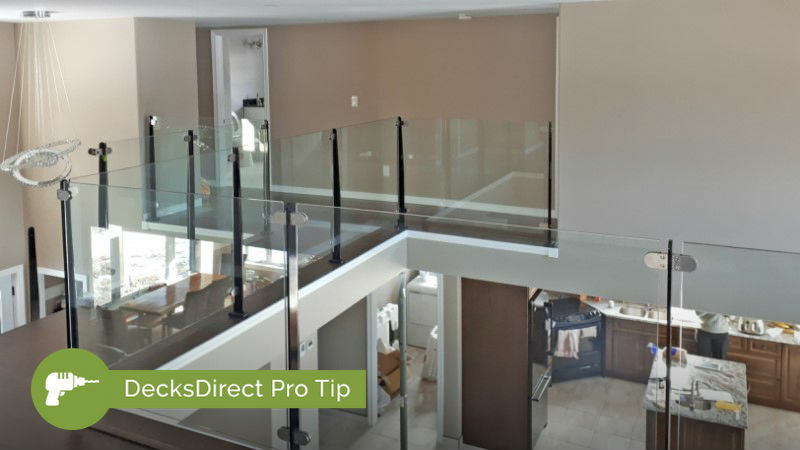 If you're looking for a modern and luxurious looking way to get the best view of your backyard, look to glass railing systems to help you both connect with nature and impress the neighbors. Browse through Glass Panel systems such as the sleek InvisiRail Glass Railing or Westbury Veranda; or choose an option that keeps the breeze flowing through all summer long such as Fortress AL13 & Pure View Glass Balusters or the stunning Deckorators Glass & Aluminum line.